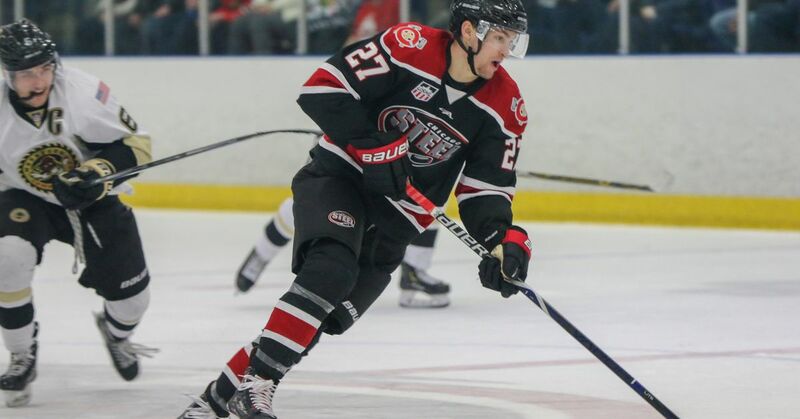 Blackhawks forward prospect Josiah Slavin scored two goals to lead the Chicago Steel to clinch a spot in the USHL’s Clark Cup playoffs with a 3-1 win over the Gamblers on Tuesday night at Resch Center in Green Bay, Wisconsin. Slavin tied the game at 6:18 of the first period with a slap shot through traffic then cleaned up a rebound on the power play off Robert Mastrosimone’s (Boston University commit) shot that clanked off the right post to make it 2-1 at 17:09. The Steel acquired Slavin — 2018 seventh round draft pick by the Blackhawks — in a trade with the Lincoln Stars in January. The Colorado College commit has tallied nine goals and 14 points in 18 games since the trade to bring his season totals to 19 goals and 41 points in 50 contests. The Steel have made the playoffs three straight years, including winning the Clark Cup in 2017. With the win, first-year head coach Greg Moore has the Steel in sole possession of second place in the Eastern Conference. The Muskegon Lumberjacks and Blackhawks prospect Mikael Hakkarainen have a 10-point cushion over the Steel. Hakkarainen — 2018 fifth-round pick by the Blackhawks — has 47 points (19 goals, 28 assists) in 39 games since rejoining the Lumberjacks after a brief stint at Providence College. The Steel have nine regular-season games remaining before the playoffs begin April 15.